RarelyEvil's 3D Tetris Pieces Puzzle with Box on Thingiverse is one of the nicest working models I have seen on Thingiverse. 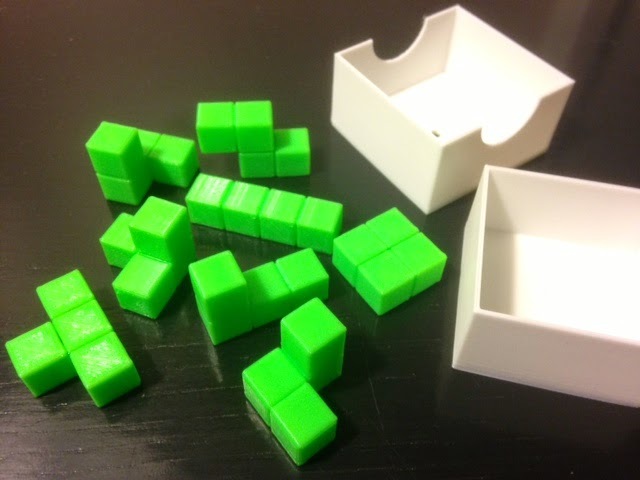 It's a simple thing - just 3D Tetris-like pieces that fit together into a rectangular shape inside a box. But the details of this model are impeccable. First of all, the pieces consist of one of each of the eight tetracubes, which is very cool. Second, they fit into a 4x4x2 box exactly (math geeks study stuff like that; for example, see bumblebeagle.org for ways to pack pentacubes and hexacubes into a 5x5x2 box). Third, the pieces are very nicely rounded and print perfectly, and the box and its top are exactly the right size. This is one of those things that is just nice to play with; everything fits well together and the pieces make nice noises when they hit each other and the world is a good place. A great model for a gift if you're looking for one. Settings: MakerWare .3mm/low on a Replicator 2, using their fantastic Neon Green PLA filament for the pieces and white filament for the box. Shameless elf-promotional note: If you like polycubes then you might also like polyominos; our newest Brainfreeze Puzzles book Double Trouble Sudoku uses tetromino and pentomino regions and is now available for pre-order and will ship in June!